We are a leading Manufacturer of coil /hot runner heaters from Navi Mumbai, India. 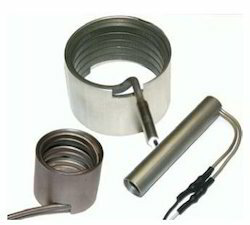 We are counted among the leading manufacturers and suppliers of a wide array of Coil Heaters. These heaters are engineered to perfection by our team of adept professionals, which possesses extensive experience in this domain. To ensure safe functioning of these heaters, we test the same on certain well-defined parameters of quality.